Another couple of things out of the UFO tub! 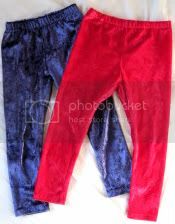 These are panne velvet leggings made using the Farbenmix Laguna pattern. Panne velvet makes such great leggings....it's stretchy, recovers well so there are no 'knees', it's warm, comfy, feels very "slinky" (so I'm told lol) and it looks really cute. Can you tell I like them? :D The only issue I have with the panne velvet is the waist elastic tends to roll over and over inside the casing, so to fix this I have stitched the elastic in 4 places......over the casing and through the elastic at the back, the front and at each side. I'm actually pretty happy with this method as one of my gripes about handmade is the loose elastic turning over inside the casings, but I have had no luck with overlocking the elastic in (as you see on store bought pants/skirts). I find the overlocking method permanently stretches the elastic so that the waists are then too big and it's such a pain to re-do. I think I'm going to do all my elastic waists using this method from now on. It makes for less fiddling later when the clothes are being washed and put away. I also found the Laguna leggings pattern was a bit generous so I didn't add seam allowance and this made them a bit more fitted. I am so glad that you shared the idea of using Panne for leggings. I used to wear a lot of OSFA Asian style dresses but now have all this fabric and didn't know what to do with it. Now I do! I think your issues with overlocking the elastic into the waist are because of the elastic that you are using. There are certain types that are better for that than others. I just can't remember if it's knitted or braided. I know the elastic I get from Greenfields works well that way. Let me know if you want me to grab a roll next time I am over there.